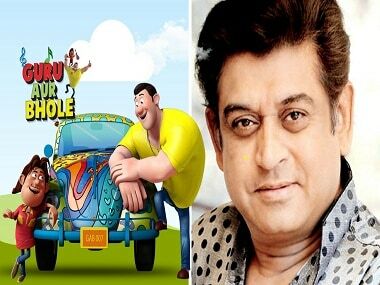 Singer Amit Kumar, the son of legendary singer Kishore Kumar, has lent his voice to an animated character named Guru from Guru Aur Bhole, Sony YAY!’s flagship show, DNA reports. According to the channel's website, Guru Aur Bhole is the story of an indispensable friendship between Guru and Bhole, the leading characters of the show. The show is set in a sweet, peaceful and "caricature-ish" little fictitious town in Northern India called Sur-Taal Nagar. Guru is the "musical mastermind" who has an immense passion for music and his whole life revolves around it. Bhole is a kind and helpful guy who always goes out of his way to help others, even if that lands him in trouble. He is also a gifted dancer. Both Guru and Bhole have superpowers — music and dancing, respectively — which are inter-dependent. Using their superpowers together, they come out of difficult and sticky situations. According to DNA, the character Guru bears a resemblance to Kishore Kumar and hence his son was approached to voice the character. Every episode of the show will feature a new song, sung by Kumar. Raju Singh will be composing the music and Sameer will be penning the lyrics. Apparently, Kumar has also sung the Hindi title track ('Zindagi Toofani Hai') of the popular Disney show, Ducktales, reports scoopwhoop.com. Guru Aur Bhole airs every Monday to Friday at 10 am on Sony YAY! tags: Amit Kumar , BuzzPatrol , Cartoon , Guru Aur Bhole , Kishore Kumar , Sony YAY!